In the last 100 years, I doubt designers have ever been more challenged with shoe designs than in the early 1940s. With World War 2 in full swing, materials were either rationed or used entirely to support the war. Between material restrictions and the dying popularity of pantyhose, there was a revolution on the fashion front – err, bottom. Read a more recent article about 1940s women’s shoes style here. To understand footwear of the 1940s, one must understand a bit of history. Rations and restrictions put in place by the government limiting what designers could use. Also, as many men were fighting over seas, women became the bread-winners of the households. They needed shoes that were practical for work yet inexpensive because of limited salaries. One such example of a restricted material was leather. Leather became entirely unavailable as it was devoted to the war. Instead, the usage of mesh, fabric and reptile skins became popular out of necessity. These velvet and mesh shoes from Dancestore.com are a great example of an alternative material. They are made of a faux-velvet. Another reason for the changing shoe fashions was the restriction placed on heel height. Shoes shrunk to the lowly height of one to two inches. However, when there’s a will, there’s a way. To gain height, ‘wedgies’, a cork-heeled wedge shoe, became a popular design. Fortunately, today there are a variety of shoes inspired from the classic 1940s, and so you will be able to gain a bit of height! Being excessive in anything was taboo in World War 2. Once again, resources were in high demand and were not to be wasted on vanity, and so shoes of the ‘40s are known for their simplicity. Decoration and accessories were minimal and considered gaudy. As you shop, you’ll notice simple and clean lines. These brown Mary Jane heels – a staple for the women of the ‘40s – are a great addition to any wardrobe or themed costume. You will notice the simple, undecorated look. During the war open toed shoes were considered dangerous and impractical in a work setting, especially factories. Working women knows as “Rosie’s” first started to wear men’s loafers or moccasins to work. They were comfortable versatile and quiet – a feature very important to pilots-both men and women. After the war open toed shoes became the rage! Peep Toes opened the front of a shoe just enough that they weren’t considered dangerous. Many regular women wore peep toe shoes however today they are mostly associated with Hollywood Bombshells or Pin Up girls. With the opening of the toe came the opening of the heel and well the rest of the foot. Many sandals were chunky with one small vents on the side and slingback strap. As the decade progresses the sandal opened up to be more airy with many straps across the toe and either a t-strap or slingback heel strap. Ornamentation was minimal. A bow over the toe was a nice simple accent. Towards the end of the decade, after the completion of the war, there was an increase in heel height and embellishment. Also, women returned to their favorite leather pumps. By the end of the ‘40s, the shoes were blurring into what would become the fashions of the 1950s. A shoe that became very popular, and is still one of the defining looks, is the heeled oxford. The heel height varies from very low to about 3”, so shop for whatever is your preference. This heeled oxford from Naturalizer is a beautiful example, and even sports some faux-reptile skin. You should be able to comfortably wear a pair of ‘40s shoes; after all, the women of the decade were busy supporting the boys abroad in them! Also, don’t be afraid to invest in a nice pair. The shoes are now considered a classic look, and as such you’ll be able to wear them with everything from dark-wash jeans to business-wear skirts to your sailor pin-up! 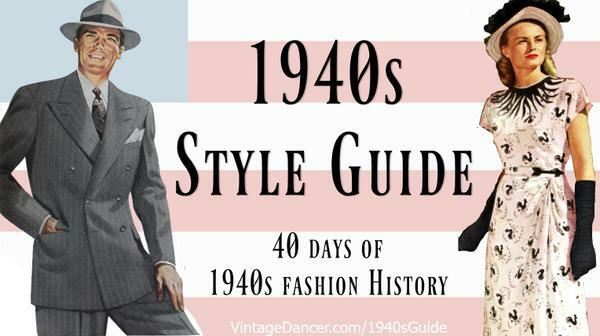 Ready to shop for 1940s style shoes? I wear toeless and healess sandals with 1-2 inch wedge. Size 5.5.. I am down to my last pair and I can’t find any more. All I can find is high or lo sandals with non-skid soles. Non-skid shoes are a hazard to me since I fall. They grab the ground, the floor and the rug. they are only good on ice. I am looking for a shoe maker to see if he will make shoes for me. I am also checking Italy and France. I prefer buying American but there are no shoes for me that are made in America. I would contact Celebrity. They make custom shoes with smooth soles (for dancing) but they will work well for what you need. Sometimes their website is down so I would call or email them for a catalog or just describe what you need. It’s so funny how some if not all of these styles of shoes are making a come back! Love it! Thanks for this article! Thank you for this post. My boyfriend is in the airforce and I have been looking at 1940s style clothing for us to have pictures made together. This information was quite helpful.